Minnesota is home to one of the nation's largest systems of manmade drainage ditches. One estimate says there are more than 20,000 miles worth. The ditches carry water from farm fields, making the land tillable. They also carry eroded soil, and most of the sediment ends up polluting state rivers. 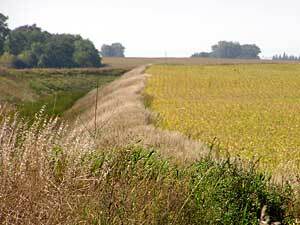 One way to reduce runoff is to plant grassy strips along the ditches to absorb runoff. State law already requires so-called buffers along a small number of ditches, but some say even that minimum requirement is largely unenforced. Jeffers, Minn. — The state's drainage ditch system is a maze of unknowns. How many miles of ditch are there? How many miles are supposed to have grass buffers? How many actually do? And perhaps the most important question -- how much sediment do the ditches carry? The state is searching for answers to those issues, thanks in part to a persistent voice from southern Minnesota. Greg Roiger lives near Sleepy Eye, close to the Minnesota River, which may be the state's most polluted stream. Dozens of ditches empty into the Minnesota. When the river enters the Mississippi it leaves a plume of muddy water. Roiger says the time has come to examine how much pollution comes from drainage ditches. "We are in a real predicament with the Environmental Protection Agency's Clean Water Act," says Roiger. "We have to do an assessment of the waters and see if they are impaired or not. I strongly believe that drainage systems contribute at times to the impairment of our public waters." The manmade ditches crisscross the rich farmland of southern and western Minnesota. Underground tile carries water from field to ditch, turning wetlands into farmland. One estimate says the ditches have turned almost 8,000 square miles of former ponds and lakes into productive fields. That's nearly 18 percent of the state's agricultural land. Roiger says the ditches are needed, but he also says they should be cleaned up. Roiger says sponge-like grass strips along the ditches would help. "That buffer would limit how much water was getting directly into the ditch, limiting the amount of sediment that's being carried along with the storm water," says Roiger. Minnesota has a buffer requirement. Any ditch built or enlarged since 1977 is supposed to have a 16.5 foot grass strip on each side. However, since most ditches were excavated in the early 1900s, the requirement covers only a small number, likely 5 percent or less of the state's ditch system. Sitting in a car in Cottonwood County, Roiger views a ditch he says symbolizes the buffer strip problem. Agricultural ditches are numbered; this is Judicial Ditch 9. It cuts a v-shaped path through corn and soybean fields near the town of Jeffers. Wider than a country road, locals nicknamed it the Suez Canal. Since it was dug just eight years ago, Roiger says state law requires it have the grass buffer. "I firmly believe that a big chunk of this ditch is not in compliance with what the statute says," says Roiger. He says in some places, crops are planted right to the edge of the ditch. That's exactly what state law meant to prevent. The buffer strip requirement was passed in 1977. Former lawmaker John Corbid was the chief House author of the legislation. He says based on his legislative intent, Judicial Ditch 9 is out of compliance. "My view of the measurement was that it would be a horizontal measurement, away from the edge of the ditch," says Corbid. "Sixteen feet back towards whatever field was being farmed." That means if you walk 16.5 feet from the edge of the ditch, that's where the crops should begin. But many farmers and ditch regulators disagree with that assessment. As proof, they point to a 1991 drainage manual published by the DNR. In it, an advisory committee interprets how the state's buffer strip law should be applied. The committee says in certain cases, the side of the ditch itself counts as buffer, allowing crops to be planted to the edge. The original legislative author, John Corbid, strongly disagrees with that assessment. But many farmers and government officials use the manual as proof they're meeting state law. But is the manual the same as law? A disclaimer in the publication says it "does not necessarily reflect the views of the state of Minnesota." Standing at Judicial Ditch 9, Cottonwood County Commissioner Norm Holmen says he's unsure whether the channel meets the state's buffer strip requirement. "Today, standing here looking, I cannot say that yes it is, or no it is not," says Holmen. Holmen is the drainage ditch inspector for this part of Cottonwood County. Despite that role, he says he's never checked a channel for buffer strip compliance in his three years of elective office. At its most drastic, state law allows a county to install a buffer strip and bill the landowner for the work. Holmen says it's unlikely he'll check Judicial Ditch 9. "Because we've not proved we're out of compliance," says Holmen. Holmen says he won't take any action until others demonstrate to his satisfaction a ditch fails to meet state requirements. Critics say that's an impossible standard, since it's a trespassing crime for individuals to walk on private farmland to measure buffer strips. The questions about Judicial Ditch 9 demonstrate the difficulty of enforcing any state law on buffers. Still, there has been progress. Many farmers have voluntarily planted protective grass strips. Most join federal programs, which pay them for the lost crop production. One farmer who endorses this path is Redwood County farmer Dave Zwach. Standing near a drainage ditch on his land, he points out grassy strips more than 100 feet wide on each side. He says anyone who doubts the benefits of buffers should talk to him. Zwach says a torrential rainstorm some 30 years ago convinced him to install the protective measures. "Had some terrific erosion on the home farm, and I said my way of farming has to change somehow, because we're losing the black soil," says Zwach. "So I set up this filter strip to keep the water from entering this ditch, and I know it's done a lot of good." Zwach did more than install buffer strips. His land is a living laboratory of conservation measures. A large field bordering a river is planted entirely in native prairie grasses. Zwach is so enthusiastic about protecting land and water he asked MPR to post his home telephone number on its Web site, so farmers can call with conservation questions. Zwach also has a sharp eye for historical irony. He says government officials are working to fix problems they helped cause. "This ditch was put in in the '50s, and the government actually paid my father to tile it out back in the '50s. Otherwise this day and age, I'm sure it would be a beautiful lake bed area for the ducks," says Zwach. A state legislative study group is trying to find answers to some of the drainage ditch unknowns. It will canvass local officials about ditches in their jurisdictions. Judicial Ditch 9 is one. It empties into the Little Cottonwood River, which enters the Minnesota River near New Ulm. Cleaning up the Minnesota means cleaning up each of its tributaries, natural or manmade.